History: The Battle of Plymouth, perhaps the most effective Confederate combined-arms operation of the Civil War, was waged in April 1864. Two years earlier, in May 1862, Union forces had occupied Plymouth, near the mouth of the Roanoke River. From their bases in Plymouth, New Bern, and Washington, N.C., the Federals conducted frequent raids in eastern North Carolina. Meanwhile, by the spring of 1862, two Confederate ironclads under construction at Edward's Ferry on the Roanoke River and at Kinston on the Neuse River were nearing completion. The assistance of these vessels, the Albemarle and the Neuse, was essential to the success of any attempt to recapture the coastal towns. Brig. Gen. Robert F. Hoke, acting with Cdr. James Cooke of the Albemarle, concentrated first on Plymouth. By late afternoon on Apr. 17, 1864, three brigades of infantry, some 10,000 troops, commanded by Brig. 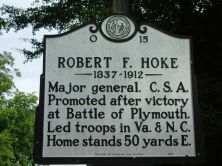 Gen. Hoke was within five miles of Plymouth. Defending the town was a Union garrison of 2,834 men. Although badly outnumbered, the Federals had strongly fortified the post and repulsed the first Confederate attacks. But the next day, April 18, saw heavy shelling, with Union vessels in the river sunk or damaged and forced to retreat to Plymouth. Meanwhile, U.S. Navy gunboats provided artillery support against the Confederates, but their success was short-lived. During the night the Albemarle, taking advantage of an abnormally high river level, safely passed over the obstructions and slipped undamaged past Fort Gray, west of Plymouth. In the predawn hours of April 19, Cooke's ship encountered the USS Southfield and USS Miami, the most powerful Union vessels on the Roanoke. The Albemarle promptly sank the first and heavily damaged the second, forcing the Miami and two other gunboats to retreat. Late that afternoon, Hoke launched a double envelopment attack against both the east and west sides of the town. The Albemarle, having returned to Plymouth, furnished supporting fire on the east side of town. On April 20, Hoke renewed the attack on each flank, capturing forts from both directions. But the Union commander, Brig. Gen. Henry Wessells, refused to surrender and gathered the remainder of his forces inside Fort Williams, the Federals' last remaining stronghold, near the center of Plymouth. Hoke unleashed his artillery on the bastion, and the Albemarle added its two large rifled cannons to the bombardment. Heavily shelled from all sides, Wessells unconditionally surrendered his entire command. In addition to the Union garrison, Hoke captured 25 artillery pieces, many provisions, including 100,000 pounds of meat, and his victory provided a badly needed morale boost for the Confederacy. Ransom's Brigade suffered 476 of the estimated 850 Confederate killed, wounded or missing. Brig. Gen. Wessells reported Union losses of 2,834 in killed, wounded and missing. He further noted that "there were also present portions of two companies Second North Carolina volunteers, native troops, under Captains Johnson and Haggard. During its siege and in the night a considerable number of North Carolina soldiers (many of them deserters from the enemy, and all of them fearing bad treatment in the event of capture), left their companies without authority, escaping in canoes, being picked up, as I have understood, by our boats in the sound." The role of the Albemarle proved critical to the Rebel victory. In addition to driving off several Union gunboats, whose guns had been heavily relied upon for protecting the garrison, the Confederates had added the ironclad's two rifles to the fight. While Federal commanders would now focus on destroying the Albemarle, one Union general noted that an ironclad or torpedo would be needed to counter the formidable Rebel ram. Following the fall of Plymouth, Union forces would abandon Washington, N.C., or Little Washington as the Federals often referred to the town. The Confederates would hold the town until the Albemarle was sunk by Union raiders in late October 1864. With the ironclad removed, the Southern troops abandoned Plymouth, which returned and remained in Federal hands for the duration of the war. 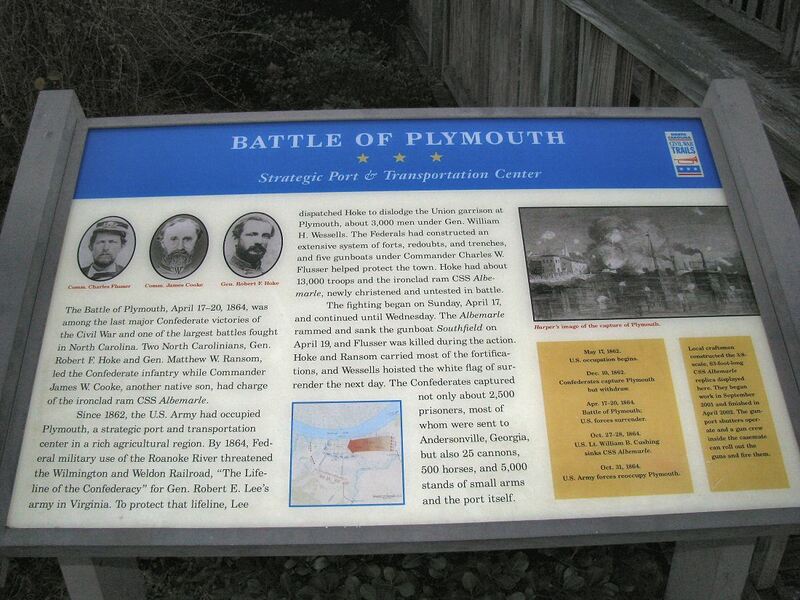 Casualties: Casualty reports and figures for the Battle of Plymouth, April 17-20, 1864, have been from muddled to exaggerated, but while Federal losses were stated more specifically, though not absolute, Confederate casualty tallies were incomplete or inaccurate. Best casualty estimates for the respective Union and Confederate forces were derived from a variety of sources, including regimental drummers, attending physicians, brigade commanders, and opposing commanding generals themselves. Union forces at Plymouth suffered 2,834 casualties, including captured and an estimated 150 in dead or seriously wounded. Confederate losses, for the three day fight, were believed to be some 850 in killed or wounded. Ransom's Brigade alone suffered at least 476 in killed or wounded, while casualties in the other two brigades, Kemper's, under Col. William R. Terry, and Hoke's, under Col. John T. Mercer, remain unknown. The latter two brigades, notwithstanding, having been involved in a fierce contest on the Union right, undoubtedly suffered heavy losses. During repeated assaults on the 85th Redoubt and nearby earthworks, and outlying forts and breastworks, both sides reported heavy losses in the brigades under Terry and Mercy, who himself was mortally wounded on April 18 while charging the enemy's works. Casualty reports or returns from Confederate commanders were incomplete for Plymouth, so while accurate figures remain elusive, a variety of contemporary writings allow us a general idea of the losses for those three days in April 1864. Preliminary reports, known as after battle reports, were often revised just days or even months later. An example of a revision was moving soldiers from wounded to mortally wounded, or from missing to killed. On the other hand, reminiscences and diaries for oftentimes stated from outright embellishments to perhaps unintentional exaggerations. Casualty figures were also speculation or hearsay, such as one referenced by Union Maj. Gen. John L. Peck, Headquarters, Army and District of North Carolina, New Berne, N.C., April 24, 1864, when he reported that refugees picked up by the US gunboat Whitehead said that General Wessells had lost about 400, while the enemy suffered not less than 1,500 killed and wounded. Union Return for District of North Carolina for April 1864. The day following Union capitulation, April 21, Col. J. Taylor Wood, Aid-de-Camp, reported to Confederate President Davis, "our loss about 300 in all." While the Aid-de-Camp had estimated 300 casualties for Hoke's command, the regimental and battalion returns had not yet been completed. 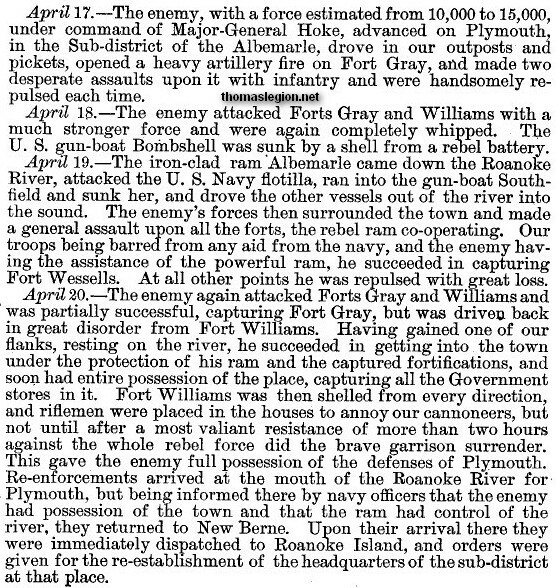 But a few weeks later, the Fayetteville Observer, May 9, shows identical casualty figures for Ransom's Brigade (476 casualties, or 62 killed and 414 wounded) from both John W. Faison, Adjutant, and Captain S. H. Gee, Assistant Adjutant and Inspector General. But in 1901, Ransom's Brigade, Histories of the Several Regiments and Battalions from North Carolina in the Great War 1861-'65, Volume 4, the writer said that "The loss in Ransom's Brigade was over one hundred killed, and five hundred wounded. The brigade captured three thousand prisoners, one hundred pieces of artillery, five hundred horses, a large number of small arms and a large quantity of quartermaster and commissary stores." As a Confederate POW, Wessells would file his reports during the summer of 1864, and just months after the fight. While he gave specifics for Union casualties, he also gave estimates for total Confederate losses. Whereas Wessells gave casualty figures for each unit under his command, Confederate commanders would also state the exact tally given by Wessells for their official reports. Much later, around 1900, when North Carolina made its grand effort to write and preserve the histories of the several regiments and battalions from the Old North State in the Civil War, many of those who wrote the histories gave estimates, while some gave round numbers, or the best figures available to them at that time. A few weeks following the engagement, Captain S. H. Gee, Assistant Adjutant and Inspector General, gave specific figures on losses for Ransom's Brigade, which was one of the three participating Confederate brigades at Plymouth. In 1900, or 35 plus years later, many writing their unit histories gave rounded figures, such as, Ransom's Brigade suffered 100 killed and 500 wounded. These figures were often accompanied by other rounded tallies, such as 3,000 Union prisoners and the capture of 100 artillery pieces. In 1901, for its official sketch, Histories of the Several Regiments and Battalions from North Carolina in the Great War 1861-'65, Volume 1, the writer affirmed 154 casualties for the 8th N.C. Regiment alone, a higher figure, or 21% increase, than the 127 reported by the brigade itself following the battle. "Plymouth was a brilliant victory, but the Eighth Regiment paid dearly for its share in it. The regiment lost one hundred and fifty-four men killed and wounded, about one-third of its number." H. T. J. Ludwig, Drummer, Company H, Eighth Regiment North Carolina State Troops. Sources: ncpedia.org; National Park Service; Official Records of the Union and Confederate Armies; Walter Clark, ed. Histories of the Several Regiments and Battalions from North Carolina in the Great War 1861-'65, Volumes 1-5. In this fascinating book, you will read about the second largest battle in North Carolina and it was fought at a small North Carolina coastal town named Plymouth, where the Confederates tasted their last victory. Intense action transpired during those four days, and the atmosphere was filled with surprise, fate, intrigue, bravery, ingenuity, hope, daring, dedication, gallantry, victory, disappointment, and defeat. The battle witnessed the likes of Cooke, Cushing, Flusser, Hoke, and Wessells, and the formidable CSS Albemarle, an ironclad warship that was not built in the traditional shipyard, but rather in a Southern cornfield. The battle epitomized the brothers’ war, with North Carolina Federal regiments fighting their North Carolina Confederate brethren; it also witnessed African American regiments (USCT) in the thick of the fight. The combined Union and Confederate casualties were just shy of 3,000, and the author offers an informative, enlightening, and interesting view of the “Last Confederate Victory." Although a bit repetitive, it is a worthy addition because it is currently the only full-length text dedicated to the battle. It is a welcome addition to North Carolina and school libraries, and to the buff that enjoys reading about the lesser-known Civil War battles and it troops (Union and Confederate) that fought valiantly. Three stars. Recommended Reading: Lifeline of the Confederacy: Blockade Running During the Civil War (Studies in Maritime History Series). From Library Journal: From the profusion of books about Confederate blockade running, this one will stand out for a long time as the most complete and exhaustively researched. Though not unaware of the romantic aspects of his subject, Wise sets out to provide a detailed study, giving particular attention to the blockade runners' effects on the Confederate war effort. It was, he finds, tapping hitherto unused sources, absolutely essential, affording the South a virtual lifeline of military necessities until the war's last days. This book covers it all: from cargoes to ship outfitting, from individuals and companies to financing at both ends. An indispensable addition to Civil War literature.